The Piano Keys Flash Cards or Flip Memory Game - White and Black Keys. Large Piano Keyboard with and without note names. All 88 keys. 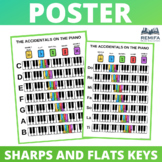 FREE Piano Keys Border and Frame - High Quality PNG Resize-able file. FREE Growth Mindset Poster. Keep your students positive with this poster. FREE Growth Mindset Poster. Click here for a blank version of this poster!Keep your students always thinking positive with this poster! 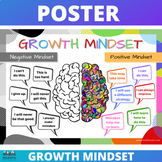 Colourful poster comparing the two mindsets: positive and negative. 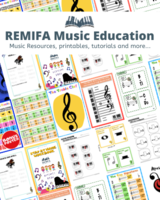 DescriptionA3 size high quality PDF poster. FREE Blank Growth Mindset Poster. TASK: complete with your own mindsets. 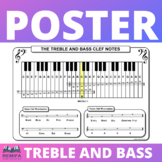 The Treble and Bass Clef Notes on the Piano A3 sizeThis is a great way to show your students how the lines and spaces of the stave represent the white keys of the piano. 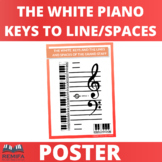 Print a copy for your students to have near their piano or in their workbooks. FREE Keyboard Labels / Stickers - AVERY L7158 - PNG file included.